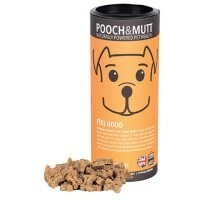 Pooch and Mutt Feel Good Dog Treats are low calory, gluten-free dog treats formulated with a delightful chicken flavour. Designed specifically to help promote dog charities, 10p from each sale of Pooch and Mutt Charity Chicken will be donated among both large and small charities. Not just the well known ones! Contains approximately 150 bone shaped treats.